Bronlaan 4, 8300 Knokke-Heist, Belgium. 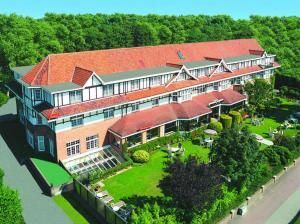 The stylish Hotel Pavillon du Zoute is surrounded by the beach and the sea, the Kings Woods and the Dunes of Knokke. 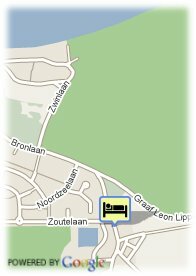 Besides, the hotel is located on the border of the green belt around the beautiful Zwin Reservation, just besides the Vlindertuin. In front of the hotel, a beautiful English garden, and behind, a large private parking. The hotel, built in the style of the Normand villas offers its guests a stylish restaurant, two large elegant lounges and an inside pool with sauna and sunbench. Besides the breakfast buffet in the morning, the hotel offers a menu of the day for the half and full board packages. Beach, Forest, Park, Centre, Countryside. Breakfast buffet of the hotel: English breakfast with ham, yoghurt, fruit juice, white cheese, croissants, butter biscuit, bread, and fresh fruit. Full and half board can be arranged in our restaurant. Numerous activities are available within walking distance of the hotel: a relaxing walk on the wide Northseabeach of Knokke: a visit to the Butterfly Garden, relaxing at Siska's and, shopping at The Zoute. For a night out, there are nice restaurants, bistros and bars in the nearby Oosthoekplein Square. The surroundings are ideal for walking and bike rides. Bikes are available for hire opposite the hotel, from here you can explore: Beach: 0.7 km. Forest: 0.2 km. Countryside: 0.1 km. Zwin Nature reserve: 1 km. Nature and country walks: 0.1 km. Bicycle routes: Start in front of the hotel. Lippenslaan (Knokke-centre): 2.5 km.